Founded in 1979, MOCA is the only museum in Los Angeles devoted exclusively to contemporary art. It is committed to the collection, presentation, and interpretation of work produced since 1940 in all media, and to preserving that work for future generations. In a remarkably short time, MOCA has developed one of the nation's most renowned permanent collections. Now numbering over 5,000 works and steadily growing, this invaluable cultural resource provides extensive opportunities for education and enjoyment to thousands of national and international visitors. 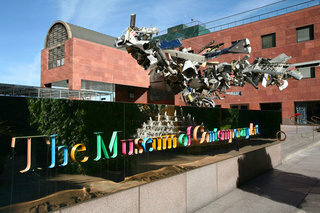 Today the museum is housed in three unique facilities: MOCA Grand Avenue, The Geffen Contemporary at MOCA, and MOCA Pacific Design Center. MOCA's mission is to be the defining museum of contemporary art. MOCA engages artists and audiences through an ambitious program of exhibitions, collection, education, and publication. MOCA identifies and supports the most significant and challenging art of its time, places it in historical context, and links the range of the visual arts to contemporary culture. MOCA provides leadership by actively fostering and presenting new work, emerging media, and original scholarship.